We already have people registered from out of region which is fantastic to see. We are very close to finalising the jam packed agenda. With presentations from Managing your AFRINIC resources to cyber security and some fun panel discussions. Social events every day, giveaways and more. We have also created a meeting room with a few tables for ADHOC bilateral meetings if you would like to sit down and meet. There is no meeting tool for this but simply a space delegates can use to have face to face meetings. 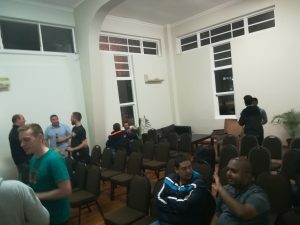 Presentations for the KZNNOG-6 Conference. assist in sorting out the Afrinic credentials etc. This will be followed by our normal beers/drinks and snacks and networking. 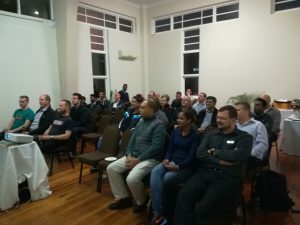 3rd KZNNOG will be sponsored by Thusa Connect. This will be the on the 30th and 31st of May. 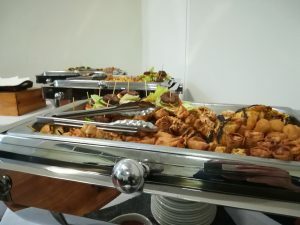 It was a beautiful sunny afternoon as a group of around 50 geeks (and some not so geeks) emerged out of their caves and headed down to Point Yacht Club in Durban for the Second KZN Network Operators Group meeting. Catching the last of the afternoon rays they all started to gather, sipping on a drink overlooking the Durban harbour. We were ushered into the presentation room to get the presentations going as we didn’t want to keep the first presenter from Cloudflare in the UK waiting. 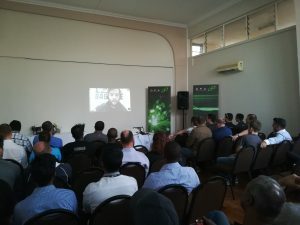 The first presentation was by Marty Strong via video feed from Clouldflare sharing the wonderful news that they were about to turn-up their node in Durban. One of the main take away points of his presentation was that Content Providers want to get as close to their customers eyeballs as possible. One of the key factors to this success was being present and connected to local internet exchanges and having bilateral peering sessions setup with as many of the ISPs as possible over that IX. This feed nicely into the second presentation by Donald Jolley on Peering and Path selection. Donald explained the metrics of BGP and how traffic and beers flows according to configured metrics. 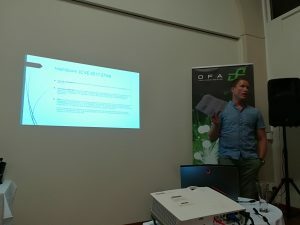 Then Edrich de Lange continued the theme by presenting a tool “AS-Stats” that shows where your traffic is following and maybe one needs to change their peering and paths to make these traffic flows better. The next presentation on Spectre and Meltdown by Nino Cloete, while not quite on the networking theme it is very relevant to the networking space as Nino explained how this bug, some would call a feature, could be exploited and affect many devices out in the field. The last presenter Nishal Goburdhan came down from JHB to join us and talk on RPKI and the vital importance of route filtering and ways to build route filters that we can trust. 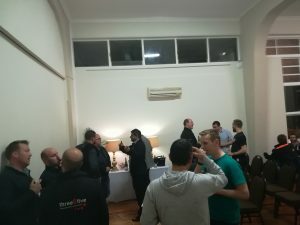 Between all the presentations there where short breaks where everyone could social network, meet new people and catch up with people they had not seen for a while and share war stories. The growing number of attendees I think shows that people find events like this valuable. It is events like this that help bring together and build the industry. Thanks to sponsors link Dark Fibre Africa for sponsoring this event makes it possible to continue to have them. 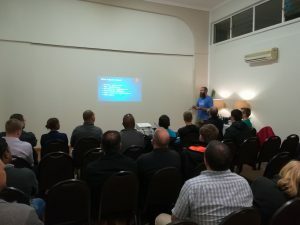 A huge thanks to Edd for all the hard work in organising the event and securing the great venue, thank you Point Yacht Club for letting us talk geek. We are looking forward to seeing you at the next one! Please RSVP on the link below and remember to join the mailinglist!